Bill had us looping west from Frankfurt, even though our cycling season was generally taking us south and east this year. The detour was to pick up one museum in eastern France and one in western Germany, both of which had been out of reach on previous tours. As we crossed the unmarked border from Germany into France on the Mosel River, many of the same images struck us in our first hours in the country as before. 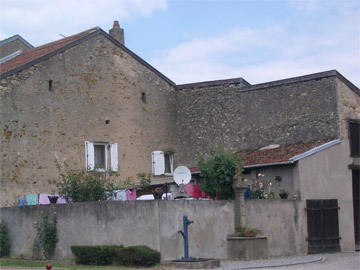 The unfinished French look, even across from the village town hall. The homes and business properties in northern European countries like Germany, Austria, and Switzerland always strike us with their starched and neatly pressed look, with the well groomed landscaping and an obviously high level commitment to building maintenance. In contrast, our first looks of France were that familiar, rumpled look. The stucco often looked like it was never painted or applied, and half or more of the buildings looked like they were disintegrating. Fresh, new windows and a satellite dish looked oddly out of place on exterior walls that appeared to be otherwise ignored by the owner. We can't ever decide if these appearance differences between the northern and more Mediterranean countries reflect a difference in affluence or are a reflection of divergent tastes and priorities. The collective conflict that the French seem to have about the US's role in their liberation in WWII is another element that always catches our eyes when we are in their country. On our first day in France this year, it was in a WWII memorial commemorating the crossing of the Mosel River that revealed the unease. We carefully read the simple memorial and conspicuous in its absence was "Who." It said "60eme" which we assumed was the 60th division or some other unit of military might, but there was no mention of the nationality or even if it was a friendly or hostile force. Bill finally found the answer on the back side of the memorial: the commemoration of the American effort was acknowledged with a monochromatic version of the Stars and Stripes. Our paradigm swung the other way however when a large, middle-aged French man in Lycra stopped to assist us at a junction on a rare French bike route. He was quick to offer help in English or German and was meticulous in discussing the route options with Bill. He clearly had embraced the US as a positive force in his life as he got off his titanium-frame bike to display the "USA" logo on the manufacturer's decal. He also mentioned that he owned a BOB trailer, which he knew was from the US. And he must be the first French person to bring up the subject of Lance Armstrong in a conversation without tagging it with "He could only have won by doping." This interchange was a breath of fresh air compared to the many exchanges with French citizens who have pulled away from us when our efforts at using their language came up short. 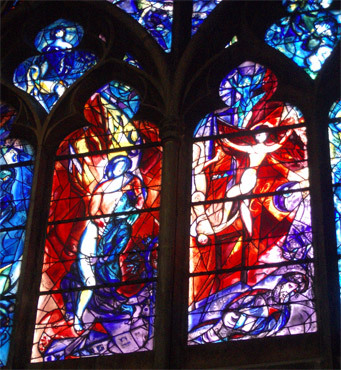 We didn't expect to find Chagall's in Metz's cathedral. The passing afternoon downpours that taunted us on the dirt segments of our bike route into the city of Metz had us mopping up mud before going into our central city hotel for the night. My new Teflon coated hiking pants indeed did shed the muddy bits as they dried, but our rough surfaced cycling sandals were hopelessly spattered. I was more presentable than Bill, so after I spruced up a bit, I did the check-in routine. Normally I would have been delighted to be told that the bikes would spend the next 2 nights in the office instead of in a parking garage, but they too were covered in mud. Despite the late hour on a discouragingly long day, I remembered the budget-priced, pre-moistened wipes we had bought in Rome and Bill remembered where he had stashed them. A half dozen small wipers did an amazingly good job of removing the worst of the mud, at least for presentability though not mechanical purposes. Even the thickest of the mud on the tires yielded to our efforts. Luckily it had stopped raining in the last half hour, so neither we nor the bikes were dripping wet. The gracious young man at the desk with a heavy French accent didn't bat an eye at our less than pristine state and rolled our bikes into the carpeted space without hesitation. We weren't in Metz long and we were reminded of Brittany on the west coast of France as it was the other pocket of the country where we felt well received. Every one we interacted with our first day in the Metz area was all smiles and welcoming including the cyclist on the path hours before Metz; the hotel clerk; the 2 men whom Bill asked for directions to a supermarket; and the checker at the market. And the next day it was the same at the museum, the bakery, and the tourist information office. People were warm and open and acted like they were happy to do business with us, which isn't what we usually experience in France. And when Bill stumbled with his rusty French, all were quick to switch to English or German or to help out by pointing, which also hasn't been the norm for us in France. 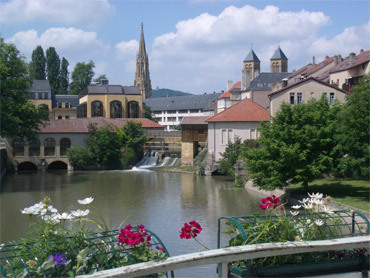 A view just a 2 minute walk from our Metz hotel. 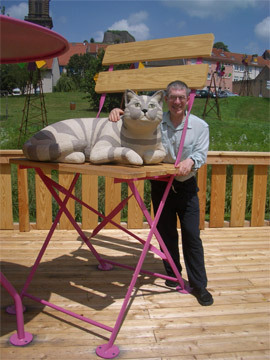 It was a delight and a relief to be able to relax this time around in France. It was easier to take in the beautiful old architecture, the pretty waterways, and the general ambiance of the city when we felt welcomed and well received. And because of it, our time in France suddenly was extended. A few flyers in the museum we came to see had us asking more questions of the very helpful tourism clerk and we looked forward to staying in the region. We did laugh however at the classical "gotcha" at the museum. We'd left Trier without seeing the 3 Roman museums because they were closed in preparation for a special exhibit. And special it must have been as some of the better pieces in the Metz museum weren't to be seen--they were on loan to Trier. Lucky for us we'd still get to see them as we decided when in Trier to return there for a day just to catch the illusive exhibits. This often fought over, eastern corner of Lorraine which shares borders with Belgium, Luxemburg, and Germany was quickly revealing more to see than Map Man had expected. For him, the draw had been the museum in Metz. The museum hadn't been so grand, but the area was quickly rewarding us with unexpected extras. Our anticipation of the special Roman exhibit in Trier focusing on Emperor Constantine was heightening as we were understanding how broadly it was drawing loaned pieces. Once in Metz, we discovered that a special exhibit on Pompeii had recently opened in the region. And our DVD lecture series on the "Origins of WWII" had reminded us of the Maginot Line of French fortifications, some of which were also nearby. So, taking a tour of some of the ill-conceived fortifications quickly was added to the itinerary. Part of this extra concentration of tourist goodies was because we were in the area during the build up to the tourist season, but it also looked like the area was richer in cultural heritage sights than the average. Trilingual signs are a treat for road scholars. I'd been lamenting that we weren't making time to study much German or any Italian and then it really seemed hopeless when we crossed the border into France. We only spent 3 weeks in French-speaking Corsica in 2006, so we were both very rusty. Bill can stumble through basic transactions in French whereas I can barely manage by relying more on context than the actual words, but we were both at a loss at first. Of course, it slowly got better. After straining to even remember the word for "Thank you," a few more words came back to me. As usual in France, Bill did all the talking and I settled for picking up a few key written words. Our museum visit in Metz held several linguistic surprises for us however. First, we were startled by how many of our new Italian vocabulary words put us in contention for good guesses in French. Their common Latin origins popped up in the word used to indicate "blown" when discussing Roman glass, the word for "wall," and one of the verbs for "to cook." Synergies like these are little victories, but speed us along as we pick our way through museum exhibit text word by word. The second linguistic surprise was that the temptation to use the French museum exhibits as prompts for reviving our Italian vocabulary was irresistible. The words for "hat pin," "ring," "bracelet," and "coffin" don't come up for us in conservations as travelers, but the items appear in many Roman displays. So, after adding dozens of such slightly obscure words to our vocabulary during our recent 10 days in Rome, we dusted them off and took them for a spin in Metz. My electronic dictionaries were blazing as I checked our work in Italian, translated a few dozen French words on the displays, and conferred with the German dictionary as I challenged Bill to recall both the Italian and the German words for some items. Lodging was again an early lament of ours during our short stay in eastern France. In anticipation of the problem, Bill had booked us a room at a favorite 2 star hotel chain in central Metz for the weekend special price of about US$67. I am sure some abhor these Ibis Hotel rooms that are a little too small and all the rooms look alike. But we have come to love the predictability of the excellent beds, squeaky clean rooms, plumbing that always works, and soundproofing that is well above average for Europe. We always get that hot shower and good night's sleep that we crave at the end of a long day. Our first night out of Metz, we headed for French motel chain that is a little cheaper than Ibis's weekday rates. They too have consistent quality and usually have the double bonuses of bathtubs and hot pots and have just added free WiFi. Even though it was midweek and we stopped early (2:45pm), we were 1 customer too late to nab the last room and went on the road looking for an alternative. After almost 2 hours of searching, we reluctantly took a private room in the next village. We knew it would be nothing like our Ibis Hotel, even though it was only about $5 less, nor would it compare to the private rooms in nearby Germany. Bill's French teacher raved about these private rooms and I am sure some find them rustic and charming, but the one's that appear where we need lodging have been overpriced and have us cringing. To us, the antiquated furnishings don't speak to an elegant past but to being worn out. And they generally have that Mediterranean level of disrepair that we find irksome. Like in Rome recently, the roller shades didn't work, but here there was nothing to salvage. Instead of being jammed as in Rome, the hardware in our "gite" was broken and missing. Having electrical outlets in which the wiring flops out of the wall with the outlet hardware as one unplugs an appliance doesn't endear us either--we like using an outlet to be a mindless act--not a daring maneuver. Our village farmhouse wasn't as tranquil as our downtown Metz hotel as we had to listen to papa's radio talk show blare outside for a couple of hours. And the non-smoking hotel room had been "olfactory neutral" whereas our stuffy gite had an overlay of stale cat pee wafting into it. For a moment I'd hoped to find a place outside our musty room to read on the ramshackled terrace, but that seemed to be where the dozen or so resident cats preferred to pee as the odor had me recoiling as soon as I opened the outside door. So as before in France, we'd side with the sterile cleanliness and good repair of the hotel chains near the freeway interchanges as we could and skip the local charm at night. Apparently the influx of giant supermarkets had wiped out the village markets, as we went for about a day and a half without being able to buy groceries. Had we ridden miles off the back road route Bill plotted, we would have found a market but we decided to make do with the unbalanced food inventory as we had plenty of calories on hand, just no produce. We had a rare dinner without any vegetables when we usually enjoy close to a pound each. The next day, we lacked tuna for lunch though had a package of "brick" bread in deep storage. We affectionately call a long-shelf-life German bread "brick bread" because both its shape and density. Usually made only of whole rye grain and perhaps sunflower seeds but without flour, it comes pre-sliced in a heavily wrapped package. These 1 pound square chunks of bread are about the volume of a large donut and the color of dark chocolate, travel well, and are filling. Our standard lunch on the road is bread, canned tuna, apples or other fruit, and 1.5 oz of bittersweet chocolate each. On this day, bread and chocolate was all that we had so we jokingly referred to lunch as "chocolate sandwiches." Of course, we very carefully ate them separately, savoring the almost chokingly dense bread and washing it down with a lot of water. The chocolate came as a well defined second course. Clearly we'd have to become more meticulous in planning our grocery shopping in this part of France than had been necessary across the border in Germany. We were just getting the grocery situation in mind, the lodging sorted out, and reviving our latent French vocabulary and then Map Man had us briefly veering back into Germany. Unfortunately, our bad luck with lodging followed us into Germany the first night. We arrived in our destination town after the tourist office had closed for the day and the old industrial town lacked the predictable layout of the river towns we'd been enjoying. After circling around the heart of town without a clue as to where to find lodging and not being able to make sense of help given by a local, I nudged Bill to go into a public building that had a trickle of people entering. Most of the businesses were closed for the day (or permanently) but there was life in this one fine old building. The first person Bill found happened to be an English teacher and the people filing in were the adult students in his next class. The trim and grinning man came out to admire our bikes, shake my hand, and to urge us to come to his class after getting our room at a new, nearby hotel. It was late, we had a slab of frozen Alaskan salmon thawing on the back of my bike, and we desperately wanted to hang it up for the night. But as Bill checked-in at the hotel, I decided we should honor the man's request. He was the second English teacher to help us out that day, the other being in France, and it seemed time to return the favors. The 10 minutes we were asked to spend turned into 2 hours as the English teacher asked us to stay for his second class. We were stunned at the advanced language class as their reading material was centered around US politics. We were scrambling to comment on "Why did the American people re-elect George Bush? ", "Will Bill's charisma interfere with Hillary's election campaign?" and "What about these 3 beliefs of anti-European Americans?" It was all in a friendly tone but none of the adult language classes we ever took dealt with such heady questions. Fortunately, we were also invited to talk about more familiar subjects, like the psychological challenges of replacing our working lives with full time traveling, our European roots, and where we traveled in Turkey. 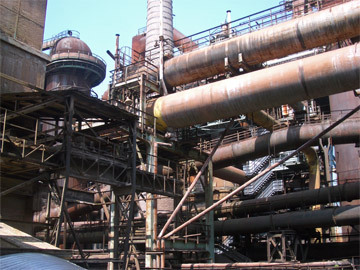 The massive scale, the massive number of pipes was daunting. The UNESCO World Heritage Site steel mill was the reason for being in Volklingen, though the English classes will likely be just as well remembered. Always hungry to understand more, the steel mill exhibit didn't satisfy our curiosity. The audio guide was a help, but had we not already gotten the basics of iron and steel production in our brains from other exhibits over the last few years, the self-guided tour would have been a meaningless swirl. But despite the muddled presentation, it was indeed awesome to climb on so many surfaces of this massive operation. We walked up to platforms almost 100' above the ground, only to look up at more apparatus towering above us. Over and over a gain we were struck by the enormous scale of everything: the piles of coal and ore; the labyrinth of monstrous pipes; the thickness of materials used; and the massive area the plant occupied. It's definitely one of those "glad to do it once" activities that shifts ones understanding of the way things work on a very deep level. 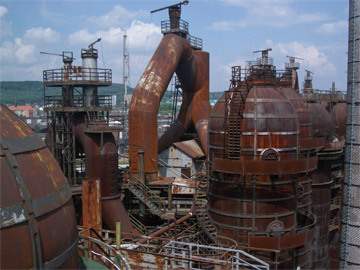 High above the blast furnaces--and look at all that rust!. The day after our extensive visit to the steel mill, we traveled a little over an hour by train back to Trier to see the 3 museums that were closed in preparation for the special Constantine exhibit. Fortunately for our endurance, it was really 1 significant museum with secondary exhibits at 2 other sites, so we managed to see it all in less than the available 8 hours. The emphasis was on Emperor Constantine and especially his influence on Christianity. We had no idea that Constantine became such a cult figure for Catholics and European leaders, and was sainted by the Orthodox church. No photos were allowed, so we have no graphics to share from the exhibits. As expected, some of the missing items in the Roman exhibits in Metz, France were on display--in fact, better displayed than they would have been in Metz. We both started grinning as we read the details of a gold helmet on display as we both recognized it as another missing exhibit, though this one was missing from our visit to Novi Sad, Serbia in 2005. The sorry little Serbian museum's real claim to fame was several gold, Roman-era helmets, but they were in restoration for an indeterminate amount of time and unavailable to the public when we were there. We keep a "Next Time" list by country on our hand-held computers to deal with such frustration, but doubted that we'd ever be back to Novi Sad to view the helmets so it was especially satisfying to happen upon them in Trier. Just as startling as to finally see the illusive Serbian helmets, was to hear of their discovery, I believe in the 1950's. The helmets had begun to poke out of the soil in a farmer's field, but being fearful of unknown objects, the farmer kept his distance rather than peeking at them--for years. Finally, curiosity won out, and the farmer proceeded to investigate the small gold hoard with a hatchet. The cautious approach to uncovering the helmets resulted in completely destroying half of 1 of them, but at least 1 impressive helmet was reconstructable. Though we've seen thousands of Roman objects in museums and at archeological sites during these last 6 years of travel, we continue to be in awe of the Romans, as little of their farming and construction technology was significantly improved upon until the 18th or 19th century. What was achieved technologically in the 20th century always seemed so awesome, but it is diminished by the historical perspective of the technical sophistication in Roman times. Seeing how early basic technology was established continues to be humbling. The book we are reading, Guns, Germs, & Steel, adds another layer of humility to our modern age. By the time of the Romans, most of the crops we eat today had already been domesticated, as well as the major animals we rely upon. Additionally, about 80% of the annual tonnage of crops that are grown today are from only a dozen different species, all of which were domesticated before Roman times. We are still amazed by how much of what people accomplished that form the basis of our modern civilizations was in place several thousand years ago. It wasn't until the 19th century that the technology of steel mills like massive Volklinger mill went significantly beyond the iron operations of Roman times in more than the scale. 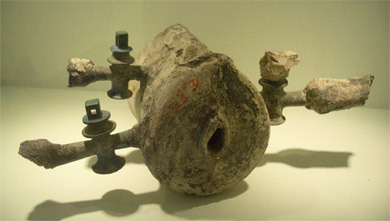 More amazing Roman technology: a water control box from Pompeii. We zigzagged across the border in Saarland or the Saar River region of Germany and France to see the historical sights ranging from pre-Roman to the 20th century. The border crossing nature of our sight seeing was underscored by visiting the Bliesbruck-Reinheim archeological park, in which the French-German border runs down the middle of the site. The line wasn't marked on the grounds themselves but on the site map. And amusingly, the French exhibit building folks made us exchange our ticket purchased on the German half for French tickets before letting us enter. The German's controlled the Celtic burial tumuli and the Roman villa ruins; the French had the town and baths ruins. It was there too that we saw the small visiting Pompeii exhibit (on the French side) that cleverly demonstrated by paired items that the lifestyle in the northern provincial town provided many of the same comforts as life in Pompeii, including glass windows, heated floors, and fine metal and ceramic table wares. And it was there that we learned that the concept for those marvelous heated floors originated in Greece, though it was rediscovered by a Roman wanting to warm the waters of his fish farm. 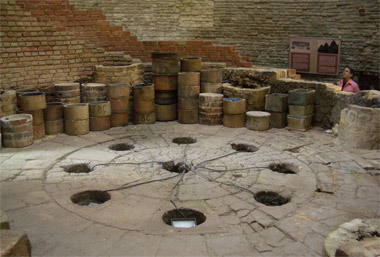 Inside a 19th century, double-walled, beehive-shaped pottery kiln. In launching for our day ride out to the archeological site, we stumbled upon a pottery kiln from the 1860's in the center of our overnight town, Sarreguemines. Of English design, the beehive-shaped, brick kiln was in operation until the end of WWII. We were reminded that the mainstay technology for firing pottery, as for so many industries, hadn't changed much in the last several thousand years. 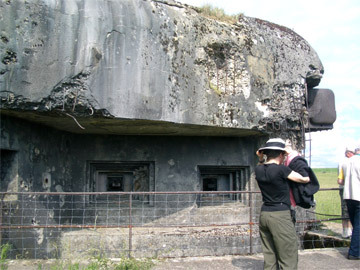 Visiting a couple of WWII forts on the Maginot Line would have been a missed opportunity had we not been viewing our DVD lecture series on the war. The Maginot defense system was discussed early in the course, just as we happened to be approaching the very area. A helpful tourist info clerk in Metz, France alerted us to the need for advance reservations for the only fort open 7 days a week so, duly informed, we were confident we'd see at least one compound. The little bit of Fort Casso that was above ground. As we listened to our lectures, the Maginot Line struck me in a quirky way as France's Pearl Harbor. Both the Maginot Line and Pearl Harbor symbolize gross and costly miscalculations by homeland governments as to the war they expected the aggressor to fight. The Maginot Line was a massive system of forts that buried the soldiers and materials safely 100' underground and righted many of the wrongs of the terrible trench war conditions of WWI. The only problem with the defensive line was that the Germans went to the north of the forts, violating Belgium's neutrality, which the French had hoped they wouldn't do. The state of the art, budget-breaking forts were instantly useless as a defense. In an odd way, the miscalculation with the Maginot Line was like the misplaced confidence reflected in the US by only operating radar 3 hours a day at the time of the Pearl Harbor bombing, even though an alert had been sent out about the risk of an invasion. Of course, both situations were more complicated than that, but underestimating the boldness of their opponents quickly and tragically revealed the planning naiveté of both Allied countries early in that war. The day before we were scheduled for our Maginot fort tour in English at Simserhof, near Bitche, we rode right by a smaller one, Fort Casso. By chance, the once-daily tour was beginning in 20 minutes and reservations weren't in order. Unfortunately, the tour was only in French, but one French tourist dusted off his rusty German to alert Bill to a few key points, including the "Watch your step" comments. We hardly understood a word, but the charming host bulging out of his cotton sweat pants made us feel welcome and engaged all with his hands-on approach to the tour. He had all 10 of us crammed in a gun turret and selected 2 women to sit in the gunner positions while he had a pair of men doing the heavy work of cranking on the levers to raise and lower the massive guns. 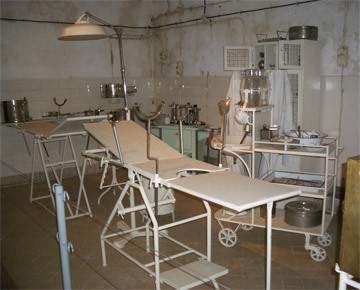 Surgical suite at Fort Simserhof on the Maginot Line. We expected a 20 minute tour, but it lingered on for 3 hours. We were disappointed to still have over an hour of riding left for the day when we popped up to the ground level for the last time at 6 pm, but Bill put us out on the main road to flatten the route. Fortunately it was late enough that the traffic was down and we had a quiet, twilight ride into Bitche. But I had received my wish, which was to see 2 forts, not just 1, for the depth of understanding the second visit would provide. Simserhof at Bitche was the 4th largest fort in the network and the tour was in English, but it was a much more sterile experience. We walked the long halls and rode in the trolley for the special effects presentation, but we didn't visit the turrets, peek out the gun holes, or pop out emergency exits as we did at Fort Casso. We dutifully confined our visit to the basics, like the electrical generation room, the infirmary, and the kitchen. Our more contained visit made us so glad we'd had the impromptu experience at Fort Casso the day before, despite getting in for the evening later than we like. Another hop across the border into Germany was to visit tiny Minfeld, the ancestral home of one of Bill's father's relatives who left Germany in the mid-1800's to avoid military duty in yet another war. Bill's inquiry as to the location of the old cemetery led us to one that was almost exclusively post-WWII graves. Bill ducked out of the rain to ask at the nearby flower shop where the old, not the new, cemetery was. After a discussion that taxed his German vocabulary, he left with the understanding that the old cemetery didn't exist anymore. Puzzled, he tried another tack, which was to ask the same shopkeeper to check the telephone book for the family name. Indeed, there were 5 listings that all appeared to be in 1 household. His lack of prior research and the unremitting rain made it feel like he'd done enough and we went on without even a photo. The unremarkable town was preparing for a festival and any possible picture subjects were concealed behind traveling carnival wagons. Despite the cold rain, we pulled into the cemetery at the next, larger town. A systematic search of the headstones again revealed that it was almost exclusively a post-WWII graveyard. Like at the cemetery at Minfeld, we spotted a couple of old headstones against the perimeter wall. Now we wondered if we had indeed visited the old cemeteries of both towns but that they had largely been destroyed during the war, save the graves on the perimeter. It was a sobering, odd twist on the devastation of war: to even have the long-dead obliterated. This larger town cemetery did host the local military memorial and we found 1 man with the family name on the "Missing in Action" list from WWII. It was a meager find, but it gave a little bit of closure to the rainy day quest for family roots. After border-hopping to take in the best of the area's sightseeing and to make an attempt at finding some ancestral connections, we found ourselves departing France with a glow of success. After our early glitches of 'chocolate sandwiches' for lunch, a goofy private room at a 'gite', and getting the hang of finding groceries in the region, we got it right. Bill had great success with regional tourist office brochures for selecting fresh, local 2 star hotels and we got better at guessing in which towns we'd be able to buy food. Though we encountered a few people who denied any knowledge of English until they disapproved of our French language skills, many more were quick to help with English or German. And we had the good fortune in our last several days in France to fine wonderful artisan bakers who had delightful assortments of chewy, tasty breads. Though they weren't the more wholesome whole grain varieties, they were full-favored, heftier white breads that we'd miss. We knew our museum-oriented sightseeing binge was behind us and that our stimulation would come more from the scenery along the way than special destination events for the next month or 2. Was it the vinaigrette or those mushrooms?? So, we feasted on our last batch of shredded carrots in vinaigrette sauce, said goodbye to the country for this year, and headed back across the German border. As hoped, the price of berries plummeted and the availability skyrocketed. In our first half hour back in Germany we delighted in buying 6 pounds of berries and cherries. They were scrumptious and couldn't be passed up at the bargain prices. We ate a pound each of strawberries and raspberries minutes after buying them. We weren't surprised to find them in Germany and not in France, but continue to be baffled by this difference in produce prices and availability that we'd seen before. But the next morning a German man who invited us to shelter from a downpour in his carport urged Bill to route us onto the French side of the Rhine for our day's ride. He said that the bike route was prettier on that side. We usually yield to local advise and so back to France we went. "But only for the day" Bill said, as it was Saturday and shopping for food and finding lodging would be more difficult in France than in Germany. 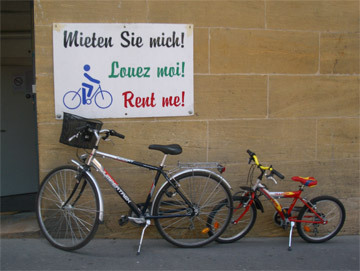 Indeed, the newly built bike route was lovely and we had a pleasant day's journey on the French side of the Rhine. The crisis came when it was time to take the ferry back across the river to Germany, as the ferry was out of order. It was too many miles to the next bridge, so now the scramble was on for food and lodging on the French side. The markets in both countries would be closed all day Sunday, so we needed to fill out our pantry for the evening's dinner, plus Sunday's meals, and ideally, through lunch on Monday. Prior bad experiences had taught us that the villages in this part of France had no markets, so we'd have to make a detour inland to a bigger town to find one. Markets would start closing between 5 and 6pm and it was now 4pm. A German cycling couple on the path advised us to possible places to find food and lodging. After following some annoyingly deceptive town center signs, we had wrapped up our food shopping by 5:30, but the hotels were full. Saturday night in France can be a problem and we were competing with the lodging demands of village weddings. We pressed on towards the next possible bridge into Germany, desperately hoping to find something before then. We'd happily squandered our time on a leisurely day admiring the scenery and waiting out thunderstorms and weren't pleased to be doing a forced march when we should have been eating dinner. More detours on the bike path took us farther out of our way and handwritten signs for a wedding in the next village dashed our hopes of finding a room in the lone hotel. One hotel in the previous village was completely unstaffed because of a local wedding and the stillness at this next hotel foreshadowed a similar story. I was relieved to hear a sniffle from the window above as we rang the bell, hoping the hostess was in. She happily switched from French to German and urged us to wait as the caller on the phone might be cancelling their reservation. Unlike the night we stayed in a tacky "gite" because of fully booked motels and hotels, here we scored a cancellation and got a lovely, quiet room for about the same price as the gite. It was so quiet in fact that we overslept almost 2 hours in our north-facing room. 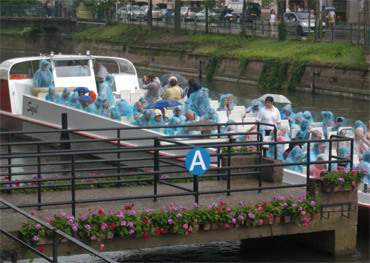 Strasbourg tourists wishing their tour was in the covered boat. Strasbourg hadn't been on the itinerary but when we were only a day's ride away, Bill decided we should again postpone our departure from France. The archeology museum and its impressive cathedral were enough of a draw that we again zigzagged along the German and French sides of the Rhine River depending on the advise of the local riders to reach the city. Strasbourg's German heritage immediately showed in the "fachwerk" or timbered old buildings and the many waterways added to the charm. The on-again off-again bike paths into and within the city earned our praise for their efforts and our hope that they will persist and eventually connect all the segments. The profusion of young, daytime prostitutes; the excessive number of street-side alcoholics; and too-frequent whiffs of stale pee reminded us of the French city scene that we hadn't yet experienced at our smaller venues this year in France. So after a 2 night stay in Strasbourg, for at least the third time in the week, we said goodbye to France. We had more carrots in vinaigrette sauce and found a favorite bread at the nearby bakery so as to close our visit on a happy culinary note. We then looked forward to indulging in strawberries once we crossed back over to the German side of the Rhine. We did finally stay in Germany and meandered through the Black Forest on our way to the Italian Dolomites. The forecast of every other day showers instead delivered daily thunderstorms but we found enough shelter to allow us sit out many of them. It was warm enough during most of the storms that we took to reading until it calmed down again. Usually during such storms it's cold and there is no place to hide so we just keep going, but not here. It wasn't long until we were in western Austria and on a horrific bike route: 10-15% grades on gravel and in the rain--yikes! We availed ourselves of public transportation and quite unplanned, arrived in Italy last night.